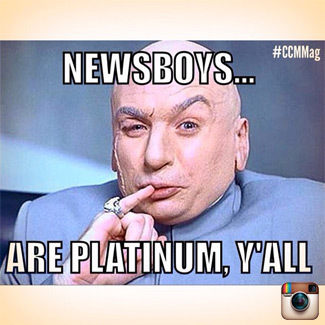 Congratulations to the Newsboys for “God’s Not Dead” Going Platinum! Newsboys’ iconic anthem, “God’s Not Dead (Like A Lion)”, the title-cut from the group’s 2011 best-selling Inpop recording, has been certified Platinum® by the Recording Industry Association of America (RIAA), it was recently announced. Signifying single sales in excess of 1 million units, the award marks a career milestone for the GRAMMY®-nominated mega group and is the first Platinum® single certification in Christian music this year. In the music world there are few awards bigger than receiving a platinum sales award. It means that the Recording Industry Association of America has verified that one of your albums or singles has sold more than ONE MILLION copies. We just found out this is true for the Newsboys single “God’s Not Dead (Like A Lion)” and we are writing to say thank you to YOU. You have helped make this possible but more importantly you have helped spread the gospel message worldwide by supporting this song, the movie and the movement. So we share this award with you today. 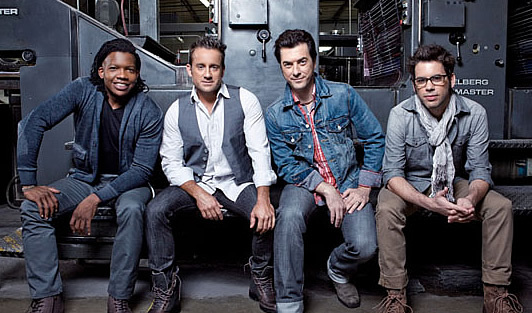 Comprised of lead vocalist Michael Tait, Jody Davis (guitar), Jeff Frankenstein (keys) and Duncan Phillips (drums), the band is nominated for two 2015 Billboard Music Awards — including Top Christian Artist — and they are among the leading nominees at the upcoming K-LOVE Fan Awards later this month. > You can find out more about the Newsboys by visiting newsboys.com.